Congratulations to Lois & Janet! 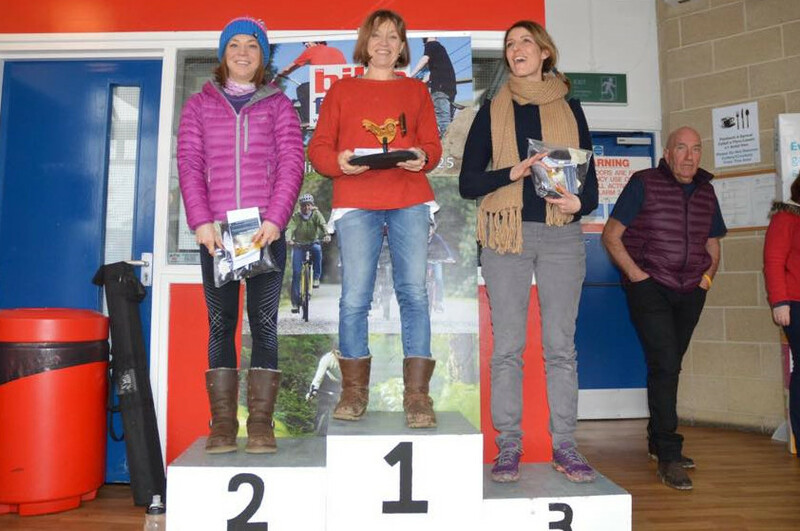 I am sure you will join me on congratulating Lois Lee and Janet Burthem on their podium places at the end of the North Wales Cyclocross Season this last weekend. While some might consider it an unholy combination of road/mountain biking interrupted by running and jumping, there still seems to be a large group of mad wo/men keen to go through this hour long ordeal every fortnight in support of the local event series. Congratulations to you both! The Ffestiniog 360 is a bit of a local legend. It is neither long, or high, nor is it delivered by one of the big brands with a highly polished experience. What it is is honest. The ride itself covers 63 miles, and around 4,500ft – with funds raised going to Ty Gobaith / Hope House – a local, and worthy charity. Marshall’s, tea, biscuits, water, support en route, and brews / cake all come as part of the deal…. oh, that and some of the most fantastic scenery as you head in and out of Snowdonia with a tour of the Ogwen Valley. The ascent is within reach of all, and the distance presents either a challenge, or a faster paced proposition… it is a Goldilocks of a course. The route changes direction each year – but the route remains the same. It is either the lung-busting-leg-burning-fresh-from-the-car-park-start ascent up the short side of the Crimea Pass, or the eight mile approach from the other side in the closing stages of the ride (the last two being particularly ‘noticeable’). This year saw the latter. We had rallied together quite the group as a club. We had the classic intermediate and long / hilly Sunday groups and then others – some of which were new… new faces, new names, same colours, all good. We had opted for a later start than the penned 0830 official one – we are an hour and a bit away – getting sorted – meeting up – and so on – it seemed to make sense. Even more so today as the rain had been hammering down since sun up. We arrived and the car park was full. We started the crawl around the unfamiliar back roads of Ffestiniog looking for somewhere van sized not a million miles away. On finding a spot, we de-bus to find not, one, not two, three, but five familiar cars and accompanying faces. Getting our game together was now becoming more of a familiar ritual. The leaving the house with a bag-of-options early morning with that inescapable feeling of ‘what have I forgotten?’ still lingering until the last pocket is packets, shoes are on and you are rolling. The wet rock and scree spoil walls that hem in Blaenau Ffestiniog are equally corralling in the clouds. They sit there like quiet giants willing their way out. The rain has stopped, the world is a wet one, but moments of sunshine are now starting to peak through from time to time. The van door slides to a close, and we pedal slowly uphill (always), and along to the start. The start. No, of course I have not brought my confirmation email with me – yes – it may have said to – but that was then – this is now – and no… I am just happy to be here with two shoes and enough gloves… now you want me to print an email from last year? Oh. Panic over – there are lists sorted by names – great success. I am presented with a card to get signed off along the route, and a fluorescent green square of self adhesive vinyl for my helmet. This is not the best – no one likes that. If it was a flat thing – sure – but it is full of vents (for a reason), and ridges, and stuff – not ideal. I see some others have theirs stuck to their bikes… better… but… ahhh – bottle – there we go. Sorted. A brief toilet stop – and I am good to go. The VCM assemble – we really do have some numbers out here this morning. The lightning fast Jnr’s are keeping themselves to themselves to one side while the rest of us oldies gather together and chat. Before too long it is time for the off. Now Sundays usually dictate at least two road rides – an intermediate and hilly/long – but no this was a rolling start for all. A fantastically mixed group rolled out resplendent in our red black yellow and while. A right turn and the first descent and suddenly the group was already starting to split. Even with the wet roads, the group clearly went downhill at different rates, and within a few minutes the group around me had thinned down and looked a little more familiar. The second descent was more memorable. I had clipped the side of a wet manhole cover while braking on the first – and I was now up for ALL of the caution. Wet roads, and a winding descent with stone walls, and the occasional hairpin – what was not to like… it certainly had my attention warmed up if not the rest of me. Somewhere around this point I heard the noise that turned out to be Vic’s over exuberance into a corner followed by wheels in the wrong direction, a sketchy moment where it all looked a bit bleak – and then the most epic of recoveries. Kudos. This was not the day for heroics – you have to be on the bike to ride the course. The course was the reverse of the last time I rode it. I was glad to be going down what was up before. However – for a “mostly flat” course with a big climb at the end – it was not flat, a bunch of noticeable ascents dug into us presenting with unanimous surprise. Particularly that first steep one. A slow and gradual ascent was upon us. Accompanied by the labouring of a steam engine with the occasional whistle we made our way as still quite a large group of riders up the ramp. Passed by two riders, it was noted by my partner in crime at this time that they would probably not be off the front for all that long and we should just settle in. Fat chance. Slowly the speed crept up, and then a little more, until the two by two went to a single file, and then that stretched further until ….snap… I was off. Off what I thought was the back of our group. Sadly I watched the group of comrades move away from me (cue exit music from The Hulk) – but glad the burning sensation had ended, and I could go back to not trying to hide how hard I was pushing. I wiped the fine rain from my glasses – promptly knocking out a lens and hearing it bounce on the road. I stopped to retrieve it to be joined by David and Justin who apparently were spat out a little earlier. Vision and company returned we set about taking back the places lost. Never knowingly under greeting – we actually did as intended, riding back up the now shallower grade far more suited to us, with a constant stream of good morning, hello, nice weather… as we went. At the top there – the familiar form of Alan – who had stopped to get us back to the main group. Downhill now, another train visible chuffing across the hillside ahead of us. Our group of four now making good progress, and before too long at all back within the fold, and most importantly now infront of those earlier passers. It is the small things. The pace now good, comfortable, but we are not hanging around either. Trying to picture the route in our heads it is apparent that we are all agreed that we have no idea however it ends up on the A5 and heading through the Ogwen Valley, Capel Curig, Betws y Coed, then Crimea Pass and into Blaenau Ffestiniog to finish. The weather is already easing up – and the gillet off before I started is now a fine choice. Climbing up and then down through woods with some bends that caught our attention it is on and past what appears to be the first check point. At this point there is a bunch of shouting backward and forward, and blank expressions. Do we want to stop? Do we need to stop? Should we stop? The latter was the right one, we looped back (from now quite some way up the road) and headed down to get our little books initialled. One man, a van, a bridge, a river, a rock, some large bottles of water, and a lot of riders. As it turns out – we stopped, hassled the very busy man for his signature (15 mins of fame didn’t seem to be all that much fun), and ate, filled bottles, toilet, and laughed. Today was a good day. Curiously revived from the few moments off of the bike we headed back onto the route. Now a gradual climb – which before too long rewarded us with the now wonderfully well travelled “Where’s Wally?” that is the sizeable VC Melyd banner (that has a delightful habit of turning up en route of so many events, in so many countries). More smiles, and encouraged we started to up the pace… meeting more traffic, some without engines – some with. We are faced with the insecurity at the turn of riders coming the other way (which transpired to be a member of their group missing with a flat) – then catching back up as a group before a junction and on again. Our still quite sizeable group is now starting to pick its way through the much narrower roads of riders…. and who should we find – much to my own surprise – but the ‘youngsters’. Clearly they were taking an easy day of it! Much mocking for being caught for the fat / old boys – and then on. Skip forward to the A5 and the horizons darken as the scenery starts to scale up. It’s all good, but it is starting to put a strain on the group. In my head I can see the Glyderau, Y Garn so it cannot be far. It is – they are just big – and I am just small. The road goes on for what appears to be an eternity. We are still passing more than passed – so in my head we are in a good place. The scenery is stunning. The sky is that kind of blown out highlights of sun through clouds, and the road is wet enough to see but not hiss, you can smell the wet. Alas it is scenery tainted with “where is that @#!? ?$ lake? !” as the elastic started to stretch. As we reached Llyn Ogwen, we were now two groups. With a visible gap. Even throttling back from the effort of the climb we were now really starting to make progress, on the front group, through and off. This was what I had pictured. It was now pretty much downhill to Betws y Coed – or so my brain was now telling me. This was strong medicine, and the VC Melyd pain train was now reaping riders at pace. I didn’t have the best of views. You can hear the noises of others over the wind, and the occasional face as you take a turn, or as they come through. One thing you can sense is the joy. Smiles, yelps, shouts – this is golden. As riders came into site the odd shout of “DESTROY THEM!” came from behind me somewhere. Laughter as I pulled out a camera to take some pics while the scenery was a-blur. I could do this all day – tyre noise, air noise, scenery, big gear hauling, the occasional tap of brakes, the occasional extra input – like being on rails. Woah – woah – woah – people gathered at the side of the road ahead. Hands up and “stopping!”. Thankfully another checkpoint (which could have been clearer to be fair) as opposed to anything unpleasant. More food, a few photos, card signed, and bottles for me again – vainly going with smaller bidon’s – as my blue 500ml ones match my frame better…. the prices we pay huh? Downside meaning more refills. The incessant dripping from the peak of my cap now no longer being rain – no one wants cramp. Having watched a bunch of people skip the sign off, and others sign and go faster than ourselves… it felt great to back on the road again, and now REALLY making progress. As we headed into Betws y Coed from Swallow Falls, we are spinning out in the big gears at 50… as a car slowly rolls out of a junction and progresses at this pace – giving us time to get organised, form up, and head safely through the buzzing town, before a right after Cotswold Camping and through the leaf arched lane beside the river. The familiar overly bark-ee dog on (an overly long) chain (of all things), and back out now to the foot of the Crimea Pass. The Crimea Pass takes you out from just below Betws y Coed up past up through a few small towns, before breaking ground, into Snowdonia on both sides of you and the final kick. Eight miles in all, with the last two steeper. The rapid pace slows to a meaningful one, and there is a rider, black Castelli Gabba – ahead. You know the sort. I am glancing across now at Alan. Nothing to prove, yet, unspoken – he clearly is not having that. The pace is not increasing – but its not slowing as the climb continues. I am starting to hurt a little more than I am good with and drop from the front into line, and then notice our group – again is no longer a group – but a break away – and I am about to get stuck between the group behind (somewhere I cannot see them), and infront. This – by this point – is no surprise, however it doesn’t stop it from being a lonely place to be – especially if it means no shelter. The road wanders on, and I am caught between groups. Easing back to just uncomfortable seems to be working out just fine. I get lost in a little world of my own for a bit and I drop back to Gary and Vic as we pass through some villages, then as we gain more height and pass Dowyddelan – I am chatting away to them – to find that the rider… the riders behind me are not Vic and Gary – just some unknown free-loaders sitting in. I say nothing, and ride on. “HOW DO!” and “GOOD EFFORT!” rally from behind me – Vic is back sans Gary this time, stamping his control on the situation as we are now onto the last two miles of the ascent … I am losing my patience here – this appears to be going on … For. Ever. Soon enough the top as I remember it is in sight, the false plateau seeing you chunk through the gears, to scrub them off again for the last push. Vic has moved away to now sit and wait. Jolly nice chap…. until I pass then I realise hes proving he can catch me up and down hill…. we shall see about that. As I wind up the gearing I am met with a wall of air and buffeted about as we go over the top and take in the view of the slate mines and quarries below, and Blaenau Ffestiniog sat amidst all the spoil. As the speed ramped up heading around the bends descending into the town, I catch sight of a coke can rolling down, and across the road – like a slow motion unguided missle its going to connect – so its on the brakes – and back off again … pointing it out I see Vic is right on my shoulder. Back on the gas and down down down into the town, passing other riders, and to the roundabout and through. Suddenly it seems a bit out of place to be on the drops pushing hard to … a car park … opposite a station … no numbers … no timing … point … we are done – we sit up and coast into the car park, and lean our bikes up on the few spare bits of wall before heading over to the desk to swap our signed cards for T-shirts, slate coasters – and probably the best tea and cake I have had in a car park.. and so the debrief began with the rest of the group. What a fantastic day out. – Signage last year was a bit of an issue – this year – bigger – which is great. – Despite the course being clockwise and thus turns being right handers – it felt good – felt safe. – People en route despite the rain in front gardens cheering us on – great stuff. – Fantastic scenic route rain or shine – local or otherwise. – Water in wide necked big containers (no 500ml bottles here) available at signing stops. – Despite the A5 having an “A” in it – roads are not too busy. – Entry fee goes to charity. – Superbly organised given they are not a big sportive-co but a charity – hats off to them. Same time – next year? Hell yes. See you there. *In fact I will let you know when they open for sign ups. The FWC was looming. I had two centuries under my belt this year – a chunk of climbing, and this was going to be my last chance to get miles in my legs before The Daddy. The NWCR Circle of Hope is an event well attended by the club – and there had been a fair amount of ‘who is going / how are you getting there?‘ in the weeks leading up to it. 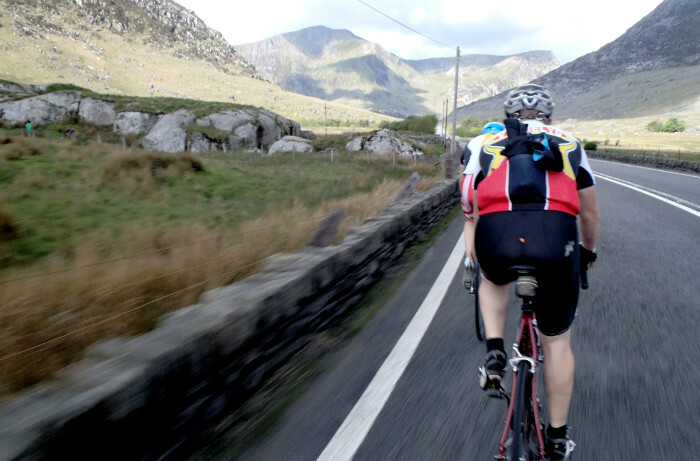 The 100 route takes in a some great scenery, through North Wales and Cheshire. Come the morning the sky is dark, the rain is hammering down, and one by one we the Facebook thread increments with “not going” responses. A group of three of us ventured over to Hope, windscreen wipers busy as we rolled into the school car park. Seeing another club member, we did the obvious thing, drove over to him, while his head was in the boot of his car, real close, real quiet and sounded the horn. Oh yes. He was pleased to see us. The discussion turned to what we thought the weather would be doing – and “the sun will dry us” became the quasi-religious mindless chant for the day. Sure, we were going to get wet, but the sun will come out, and as long as we stay warm it should be fine. Bikes out, clothing decisions, pockets filled, good to go. Not too cold – but wet. Registration, and the wonder that is ‘Sportive Toilet’. Emerging eyes watering in the rain, Strava started, and off we go. No numbers, just coloured tags on our bikes and bright hospital bracelet style tags for food stops. It was ‘orrible. The rain was still falling. The winter bike was the right choice for the day. The ride started off with a slow climb, as we ascended the rain lightened, but was replaced by drizzle, as we headed up into the low cloud. Heading up to the roundabout at the turn for the Horseshoe Pass was the first time we knew where we were, and as we descended towards Corwen – the cloud started to clear, and moments of sunshine. The turn back took us back alongside the Dee. The river valley kicking up and down, the narrower back road still wet, muddy, graveled, but it was a lot better than driving rain. The sunshine certainly lifted our spirits. Air Cadets in their crisp packet jackets (how I do not miss those) and woolen trousers stood around a table stacked with water bottles in the light rain. Bottles filled. Thank you. This being said – it must have been wasteful to be handing out so many 500ml bottles – lets see those familiar barrel types next year? Less recycling, less energy. The up started as we headed over the foot of the Horseshoe Pass, and we stopped on the other side to try and reduce layers and refuel. Gary – fully layered up after his hyperthermic Cheshire Cat finds a safe place to ferret away a coat he was wearing as an extra layer. Then on towards the ford. Okay – so, lets be straight. A *lot* of people have slipped and fallen crossing the ford at World’s End. The big difference with me is that I was caught on video doing as much. Nice. One of those things you do not live down 🙂 Nine times out of ten we cross it in the other direction. It is quite a climb to get up to that point, and then over. I reach there to see Mat on the other side with his GoPro running. “Oh how I laughed” : / The stepping stones had moved with the water, and it looks as if it had been recently de-mossed. However it was still as grippy as greased PTFE bearings on sheet ice. Teetering across the climb on the other side up through the trees is quite steep but nothing too troublesome. Clearing the trees you remember that the ascent continues for quite a way before turning to the right and skirting along the tops of the moor. Then the pace picks up, as the gradient increases, down to the sudden left turn and the main road… this thankfully did not come as a surprise to me – however there were no real warnings for those who may have been ‘making progress’. That was it really – the climbing is done, and the last 50 miles is flattish. That sounds great doesn’t it? Right up to the point the wind gets up, and you are now riding flat open exposed roads in the wind. The latter half of the ride was a lot harder than it should have been. With the climb up to the finish we were pretty much done. Wearing too many layers, too warm, and getting warmer riding into wind and little in the way of shelter. Met at the finish by Sally – we collapsed, sat around, felt a bit sorry for ourselves. The route ran up short at 93 miles – but we felt absolutely no need to do a further 7 miles. We were cooked – literally. Too far too warm. The route was good, the company was good, the charity is worthy – it is a shame the weather spoilt the start, and meant that so few took part. I look forward to next year. “The Circle of Hope ride is a local charity event that’s been greatly supported by our local cycling clubs since it started. It offers a great 100 mile route. There are other route options. It’s on the 3rd of May. VCM and RCC always have a good showing. We could treat it as an “extra” away day for the club, both Sunday ride groups as there is a 50 mile option too. The weather is due to be on the moist side – however the event is for raising funds for North West Cancer Research. Routes are 10, 50 and 100 miles taking in Cheshire and North Wales. The event starts and finishes at Castell Alun High School, Hope. While the weather is indeed looking moist the entry fee could be looked on as having ‘paid to stay dry’ (something those attending this years Cheshire Cat would appreciate being VERY worth while) and in the process the added warm feeling of having supported a local charity. For more information and entry – visit the CIRCLE OF HOPE website. Many of us who have entered in the past, or entered this year will have received an email from the organisers of the Ffestiniog360. Last year this event was well attended by the club, and a good day by all. As a supporting organisation it would be great to help out this worthy charity. If you have not registered, and you are available – it is a great day out in the park with friends – and it will be good to see you there. Spring is just around the corner and the 360 team are beginning to come out of hibernation. We already have our web site up and running, visit us to register for this year’s event. Over 100 excited riders have already registered, so get in early for what has been hailed as one of the best rides of the year. We are capping entries at 500 so don’t leave it late. Even if you’re unsure of turning up you can be sure that your entry fee will still go to our favourite charity Tŷ Gobaith / Hope House. It is extremely easy to register, with three payment options. We love every entry that comes in so please encourage your friends to take part! This will be our fourth event and we intend to make it the best yet with a well earned cool T-shirt and Welsh slate plaque thrown in with some complementary food. Amber and our lovely registration team will be there with cheeky smiles to welcome you all and get you ready to ride. You can have a coffee, take your share of goodies and look forward to a ride around the mountains of North Wales. The ride itself offers something for everyone. The club lads devour the miles with seemingly little effort whilst we mortals puff and heave. I am sure the end result is the same for us all as we take in the welcome back to Blaenau and feel epic. Ok, you have paid to enter but how about downloading a sponsorship form and ask your family and friends if they will be kind enough to part with some loose change? If a sponsorship form sounds like a pain you can join our Ffestiniog 360 JustGiving team. This allows you to collect donations without sponsorship forms. Collect donations from friends and family by emailing them a link to your Just Giving page. If everyone made the effort just to collect a tenner it would make a massive difference to the grand total. Last year we raised over £6,000 for which Tŷ Gobaith have expressed deep gratitude. You can of course still send cheques to us if you wish. Don’t forget to ask your boss at work or better still ask him or her to do the ride with you! There is a link to Tŷ Gobaith at the top of our home page. A click on their logo will take you into their world and give an insight into the wonderful work they do. There is a write up of the Ffestiniog360 over in the reports section from one of our members – if you would like to get an idea of what it is all about. Any questions – drop them a line. See you there. Some of you may be aware that there is a new sportive coming to our doorstep this summer. If not – its well worth checking out. We have a number of our number already confirmed and signed up for this event. “I’ve just a great and very detailed conversation with the organiser of this event. I’m already entered. I met Luke at the last couple of Tour of Britain events and it’s fair to say he’s keen to do a great job and wants to show case North Wales. He’s a local lad too. 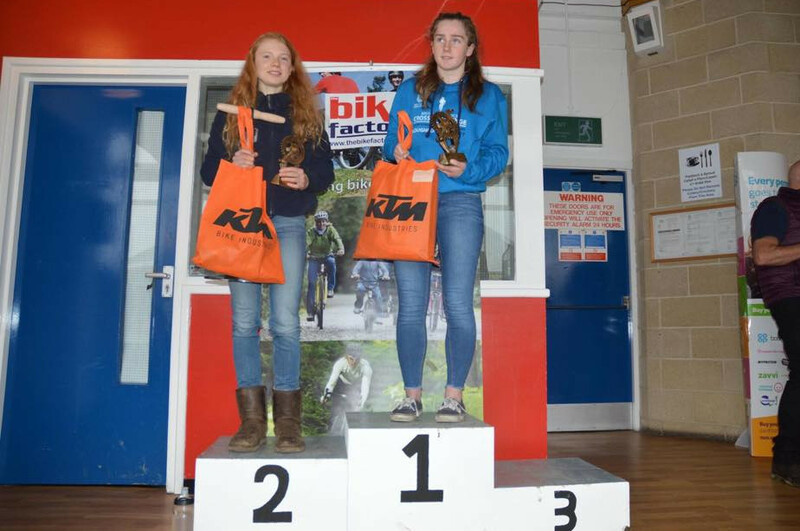 Most of us don’t ride these events for goody bags, it’s all about the experience. He’s keen that we get to start it as a club together if that’s what we want. Photos etc with you know who (Donna – hold back) He’s reaching out to all the local clubs and wants to get as many local clubs as he can to ride it. He’s aware of the price and is hopeful that, with a few yet to be announced details, it won’t price club riders out. I know we all have our views on that. Now while I can make no guarantees on weather, how much it is going to hurt, or the fact that Pitstop is going “Kick Cav’s Arse”…. it should be a great day out as a club, and on our doorstep. We have just had a great email from a jolly nice chap from the Ffestiniog 360 team at Maricraft. For those who are not aware – it is a fantastic local route starting and ending in Ffestiniog that raises money for Tŷ Gobaeth / Hope House – a local charity who do fantastic work with very poorly children. Last year the event raised a none too shabby £6400 for the charity, and there was quite the turn out from VC Melyd. This year they may be required to limit the entry to 400 riders (car parking of all things) – so if you want in – early is probably better than disappointed. Entry is NOW OPEN and for the very very reasonable fund raising price of £15 . The date for the diary is Sunday 24th May 2015. The route is around 62 Miles / 5,400ft – a fine day out in the National Park. “I am not sure if you receive our updates but we finished with about £6400.00 for Tŷ Gobaeth. I cannot be precise because there are sponsorships paid directly in addition to what we collect. The 2015 web site is now open for registration. We will be tweaking it and improving it. It is now £15.00 but we will offer a better T Shirt to everyone and there will be some goodies at the Lyn Padarn stop. Signage will be improved and the positioning of the first and third control will definitely be much better. Write up from last year – here: ffestiniog360-64mile-sunday-25th-may. According the the FB group – we are already fielding 15 participants at the time of writing. VC Melyd are now showing as an event sponsor, alongside Rhos-on-sea CC, and Antur Stiniog. Entries for the Etape Eryri 2015 open in 3 days. A great turn out by VC Melyd for the 2014 Etape Eryri this year – on our doorstep all but in Snownida. The entries for the 2015 event open on Monday 1st September – with the main events of interest being the Eryri Mawr instelf at 100 miles, and for the cyclist running out of crazy targets to acheive the Xtrem at 226. The Etape Cymru closed road sportive is almost upon us again – Sunday 14th September 2014. Entry is open up the day before places allowing. A number of riders from VCM will be taking part, and the organisers are willing to change the individual start times to assist. See the FB group for more information. It was about a year ago to the day that I posted my first comment on the VC Melyd webpage announcing myself as a new member and that I would be joining the clubs Sunday ride…excited. Then a ping came back and a lady called Sally Cunliffe announced that she too would be doing the Sunday club ride unless she was going to be cycling around the entire perimeter of Anglesey! Now, this intrigued me, firstly I lived on Anglesey for six and half years and built many wonderful memories there, so, it is a place close to my heart. Secondly, I didn’t own a road bike back then, only a rusty old hybrid, (purple with flower stickers on in case you are interested, a relic from my commuter days in London) and, later, a mountain bike…not to cycle around Anglesey on as you can imagine. Later, when I got into road biking, I often thought how nice it would have been to cycle around Anglesey had I been keen then, so, off I went to meet Sally. That was last year and now, a year on with many some excellent VC Melyd Club rides under my belt, I went back again this year with a view to beat lasts year time, this time without Sally, not hilly enough for her ;-). I had entered the Mawr which is 103 miles, same as last year. It started in Holyhead, the weather was great…except for a pretty strong head wind which one was to meet later in the day. The first 60km to the pitstop at Beaumaris was a bit of a doddle, pretty flat and I think the wind was behind us so I got there in about 2hrs. We also had the flying mile which is a timed sprint at RAF Valley, its good fun, I gave it my best shot but a mile is actually quite a long way to be going at it like a bat out of hell, well it seemed a long way to me! They also sent us over the lovely Menai Bridge and back again which seemed strange but it’s fun waving to the folks on the other side. Everyone seemed in good spirits and enjoying it. The feed stations were well stocked, except they didn’t have those yogurt coated banana chips this time which sustained me through the second half last year, and are rather yummy. Although Anglesey is relatively flat, the second half did feel quite hilly, the steepest of which is a hill above the village of Llangoed, after that it’s pretty rolling and, then, we started to meet the headwind. Fortunately I got chatting to a guy called Geoff from Rhos on Sea Cycling Club so we shared some times at the front to escape the wind, and it really helps, even if there are only two of you. After another pitstop we parted ways at about the last 20km. I was getting quite tired by then but was keen to get above my average speed of last year so pressed on. The last 10km were horrible, I was getting pretty pissed off with the wind by now, legs tired, too tired to change gear and eager to get finished. The welcome back was nice though, always makes me feel quite emotional, a good event, well sign posted, good feed stations. I did manage to beat my time, did quite well, I wonder if I will do better next year.